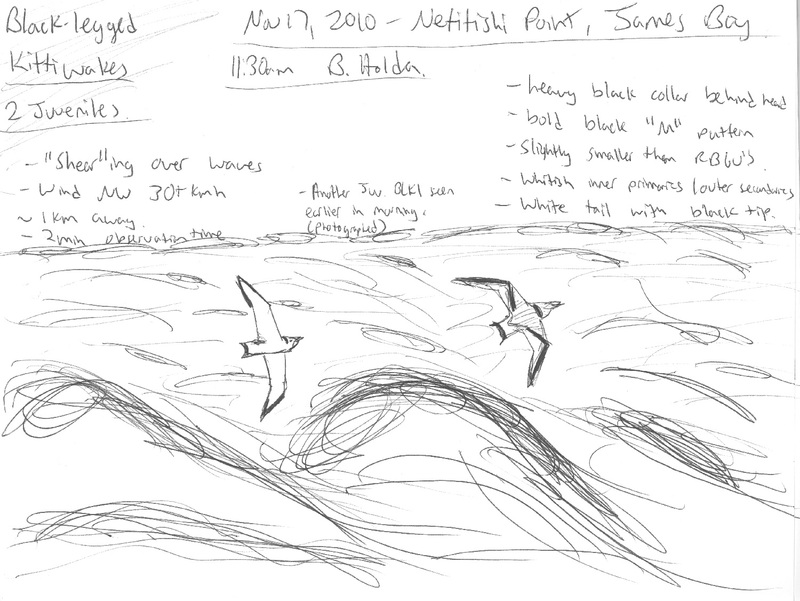 Hey Birders, Brandon Holden and I toured the north shore of Lake Erie from Port Stanley to Nanticoke. We followed the lakeshore (Front Road) the entire way. 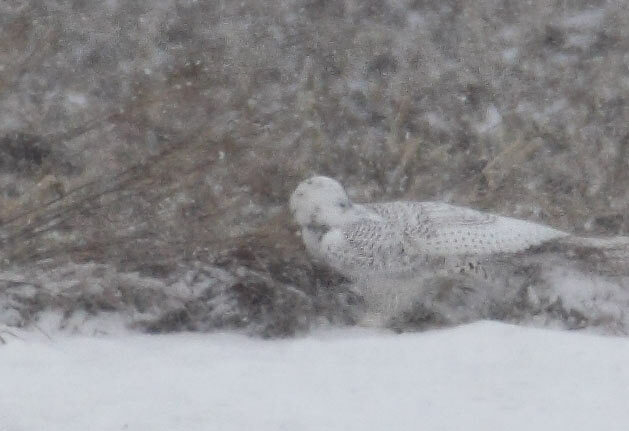 Despite the heavy snowfall we came across some nice sightings. The spotted towhee at Aarons' feeder has white at the base of the primaries! This is usually a feature associated with hybrids (Eastern Towhee's have no spots, other than white at the base of the primaries... Whereas Spotted Towhee's usually have white everywhere but the primaries. With that said, the Sibley guide comments that apparently pure Spotted Towhee's can have white here - so where does that leave us? Chipping Sparrow - 2 at a feeder with ~200 A. Tree Sparrow's in Houghton Centre, 1 'Cassiar' Dark-eyed Junco also present  - one with a very reddish cap was aged as an adult.. would usually expect these lingering/out of season birds to be young birds..
Other species seen included several flocks of the following: Rusty Blackbirds (~30 in total), Red-winged Blackbird (~120 seen), Brown-headed Cowbird (~200), White-throated Sparrow (~25), Song Sparrow (~20), Merlin (1) and Northern Flicker (2). At the time of writing, I've managed to get 266 pictures re-sized for the website - or 1/4 of the re-sizing I expect to do in order to start getting my website back online. Not bad, considering it's painfully boring. One neat thing is the chance to go back over all of the images I've edited over the years; and occasionally making changes. Sometimes I notice a dust spot that wasn't removed, or a slight change in crop. Occasionally I ponder what the duck I was thinking and re-do most of the post-processing. And there I was before the sun rose - bundled up to the max, lying on the cold concrete and wishing for ducks. What happened? Well the ducks arrived. Scaup, Redhead, Bufflehead, Goldeneye, Long-tailed Ducks, White-winged Scoters. They were all so close, I took my teleconverter off and photographed them at close range. No one dared wander down the pier in the killer weather - so I was alone to enjoy the ducks presence for hours. They eventually came. 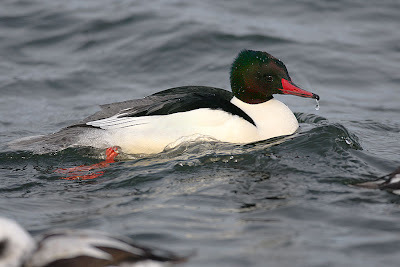 Common Mergansers. 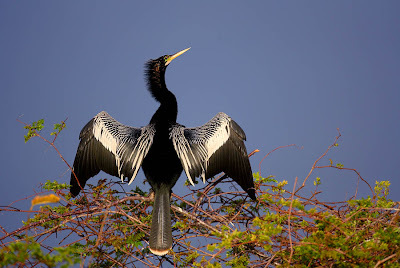 The bird I thought I might never really get. Close and comfortable with me - I took home dozens of images and was happy as someone could be in the nutty weather. Actually doing work! Honest - but what's wrong with Dragonflies?? Why would anyone want to get rid of Dragonflies? How the heck do they do it? Even if you don't know anything about them, this is largely a no-rules group, with the goal of helping anyone, with an level of interest, in odes (dragonflies/damselflies) learn more! One of my favourite odes! A Mottled Darner from Algonquin Park several summers ago. When are you going to get your website back online? Click for the real size. Hopefully soon the blog will be back on track, and I'll get some updates on the website in the very near future! Just hold tight for a few more days! 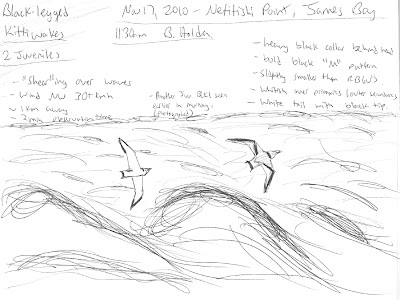 Come from where your at to hear and see Brandon Holden's depiction of his Birding invasion of Newfoundland. The Place: Burlington Senior's Centre, 2285 New Street, Burlington. The Time: Socialize from 6:59pm....microphone erupts at 7:29pm. (Yes, I changed my date from October to January) earlier this year... But now it's happening! 45+ minutes of mindless chatter and bird photos from my Newfoundland trip last year! 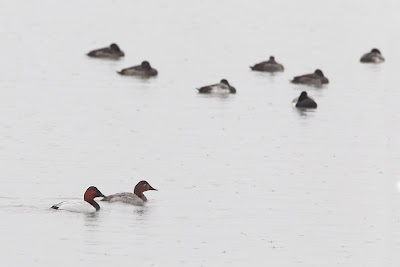 If you followed along with my blog in January and February of last year, you could hear it all again with this meeting. The only exception is I get to blow up my photos on the big screen. I don't really have much time today! And the sketch post from a few days ago was fairly well received, so I figured i'd throw up two more sketches for now. 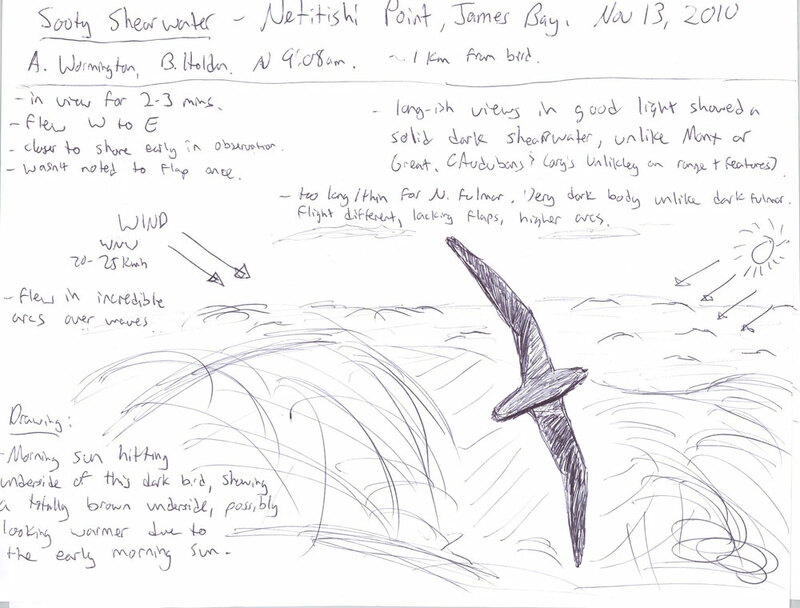 Dovekie Sketch, Nov 12, - Netitishi Point! This one was tough, since it was more shape than details, and I really stink at drawing! (Never mind my handwriting). But it's still helpful! Right? maybe? 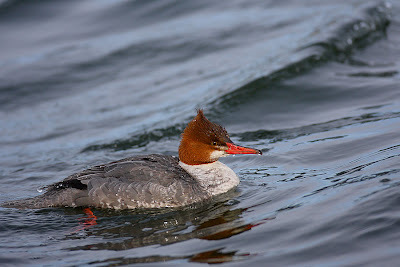 I don't often post local bird things, since I figured most people who check the blog - already know of stuff like this! But I really enjoyed the above link, since tons of people always have trouble finding these beasts. Just in case you haven't seen it, check it out! great photo - sure would be nice in Ontario! I started taking pictures because I can't draw... With that said, I'm currently working on a few things for the Ontario Bird Records Committee. 1.) I'm learning how to spell Committee. It's bad when the spell check doesn't even know what you're trying to say. 2.) 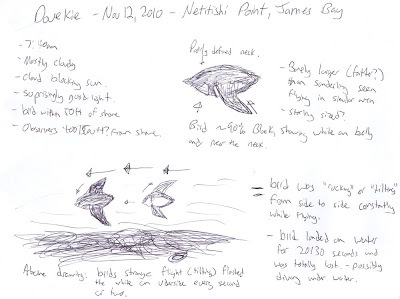 I'm writing reports for birds I've found last year. I never really had time to finish them! A big help has been sketches I completed while I was up there. More on this below. 3.) I'm voting on records for the OBRC!! (first year on the team)... It's already pretty interesting. I'm sure the job is much easier today thanks to digital cameras!!! So what does that jibberish above, have to do with this blog post? 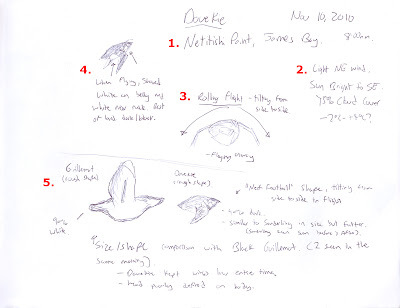 Well it has to do with sketching birds. I can't draw worth beans. I tried, and I ended up getting a camera. I've always been jealous of people who can draw - and have always thought Robert Bateman does some of the greatest things I've ever seen in print (sometimes I actually try to take photos that I think partially match his style.. if that's possible). Ok - back to the point - sketches... I really can't draw (last time I say it, promise)... 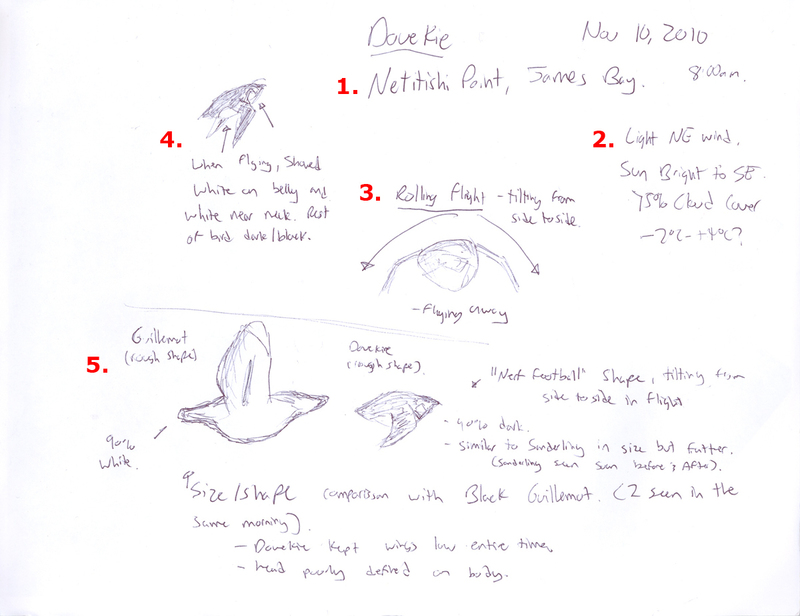 But even I seem mildly capable to draw rare birds, add some notes, and make something passable. They aren't the see-all end-all of my reports, but they really seem to add something. As stated above, photos make voting for the OBRC really easy - but there are still a number of records that don't have photos! 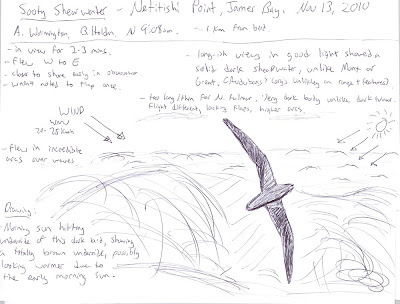 Those that have sketches add greatly to the report, whereas just text reports (while great) - are a pain to write and often get submitted to the OBRC rather short. You see it every year in the report, and I've already seen some that will probably fall under the same category. " Person X probably did see bird Y, but there is not enough in this written report to accept it as a SCIENTIFIC RECORD*"
-----*getting records that pass the olde "scientific test" - the purpose of the OBRC. 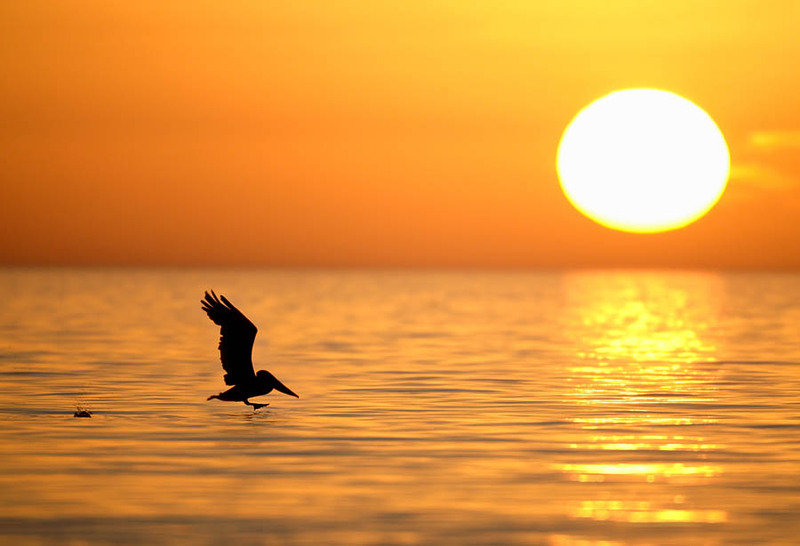 (not to try and shoot down your birds). If a picture is worth 1000 words.. I'm guessing a sketch is at least 500 (if not more). Please consider doing it! It's easier, more fun, and adds a lot to a report. Ok, with all that said... 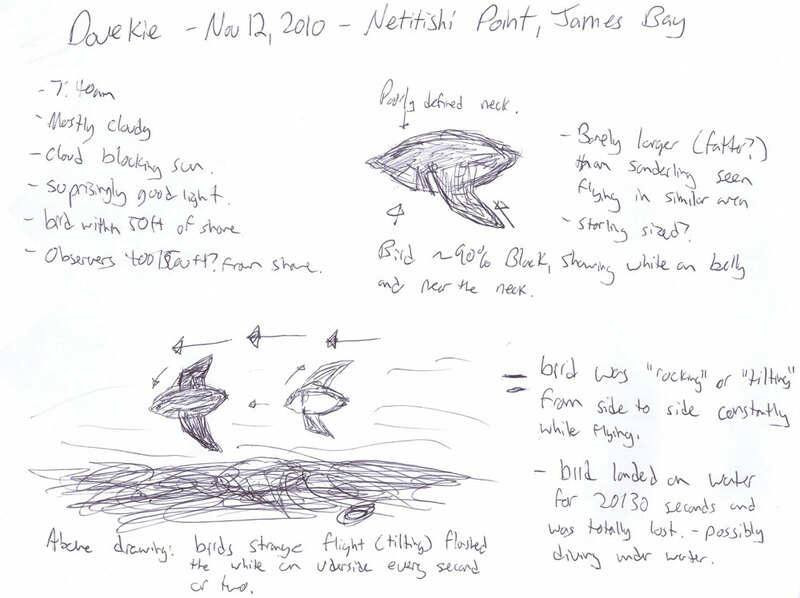 Here are two of my recently submitted sketches (along with 2+ page typed reports, not shown here). The red numbers added in photoshop after scanning. I figured my writing was poor enough, that I numbered the text, and typed it out in my report so the voting members could read what I wrote! So there you go... my horrible skills put to work - trying to sketch things. I never thought I could do it, and yes they're still pretty ugly, but if I can do it - so can you! This will be one of those posts where I have nothing noteworthy to say, just fun things I've seen on the net in the past few days. in New York and eiders can legally be taken. I do not want this to escalate into any type of anti-hunting debate. Some entertainment hopefully! Maybe soon I'll get back to doing photography, and that'll provide some blog material. Was an ill-advised trip to the Niagara River! It was way too warm to hope for good gulls, but I went none the less. Highlights were the usual gulls (except Little:) Glaucous (6), Iceland, Thayer's (1) and Lesser Black-backed. Everywhere was pretty slow. I actually had the time to drive the river, heading to Fort Erie, checking gulls and waterfowl on the way. I found two impressive swarms of Bonaparte's Gulls, feeding in the outflows of a few small creeks, that were awesome to look at (a few thousand birds within 10ft of the road). Unfortunately there was nothing unusual with them at all. 40 species total! Not terrible for a rainy day..